For the past year, it’s been nearly impossible to read a fraud prevention or compliance article without the words “RegTech” and/or “Machine Learning” in it. In this article, we are going to talk about both; specifically, how the new version of IdentityMind’s platform helps deliver on the RegTech and machine learning promise. RegTech is about incorporating technology to assist companies with their regulatory monitoring, reporting and compliance processes, both efficiently and effectively. And Machine Learning is one way of realizing the benefits of large data analysis. RegTech solutions should be able to handle your data requirements and implement technology to analyze data to bolster operational efficiencies. The new version of our platform enhances both: data scalability and data analysis. One of RegTech’s main capabilities, and promises, is the ability to use large amounts of data to drive better business decisions, risk prevention, and regulatory compliance responses. In order to take advantage of large data sets, you first need to be able to store the data and normalize it. Simple enough, right? – Except, well, not really. In many cases these two processes can be daunting. Organizations have multiple systems and data that is neither stored consistently nor uses the same taxonomy. The larger your organization, and the longer you have been in business, the more complicated the normalization process is. You have to deal with which pieces of data to store, where to store it, and how to make it available for analysis. When we started building our platform we knew of the benefits of normalized data informing multiple processes. The APIs and the models we used to record and evaluate transactions provided the needed normalization for KYC, Fraud Prevention and AML transaction monitoring. As we grew our client base and the aggregated volume of transactions to evaluate, we realized the need for greater scalability and better real-time analysis. We gave a preview of the platform back at FinDEVr Silicon Valley last year. IdentityMind Platform v1.23. – Graph Intelligence. Now, while the ability to scale on-demand with real-time performance in itself constitutes good news to all our clients and to the market; the news we are really excited to announce is the availability of our graph intelligence technology. Let us start from the most fundamental aspect of our patented technology: eDNA™. eDNA allows us to describe a digital identity based off the attributes shared as part of the digital transactions our platform evaluates (KYC, payments, transfer of money, sanctions screening, etc). The eDNA of an individual is in essence a giant entity link graph, where the links across entities are validated and verified through different mechanisms. eDNA also carries a reputational value which is calculated off the behavior of identity attributes for the transactions evaluated. Our Identity Graph Intelligence is therefore quite unique, as it sits on top of a data model that includes a broad set of the entities’ historical behavior and reputation. This is in contrast to analysis that is based off the information contained in a single transaction, which is largely incomplete and with limited context to perform complex analysis. Simply enough, it’s the difference between looking at the larger picture, or just a small part of it. Throughout the years we have helped our clients interpret their eDNA graphs, and one thing is clear, that there is a high correlation between the complexity of the graph and the risk involved in the transaction. This was obvious in finding fraud and money laundering rings, but it was less so to identify structured layering or subtle identity theft or friendly fraud. The complexity of the graph is measured based on the number of entities, the number of their connections, the directionality of their relationships, the strength of the links, the age of the information, the reputation, and the graph rate of growth, among many other factors. While a visual representation of a graph is useful, the challenge is how to make it actionable in the real world of real-time transactions, where an analyst only has a short window of time to evaluate the risk of a transaction. Identity Graph Intelligence makes the eDNA graph more accessible through a real-time risk score. The eDNA risk score is the result of applying supervised machine learning models to the eDNA graph. 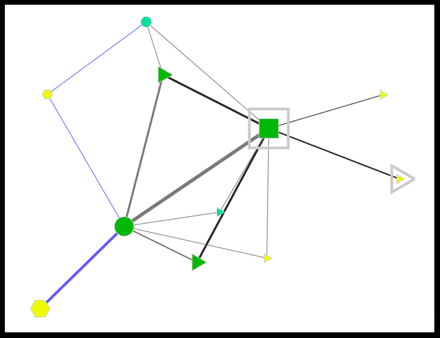 This score is a direct representation of the graph complexity. In addition, through the API, you can get access to the graph statistics including size, growth rate, number of entities, number of links per entity, and other useful stats that can inform your own risk models based off the graph data. While, in this release, we are running a single model on the overall graph, the platform provides the ability to run multiple supervised models in parallel looking for different risk and money laundering models. All in real-time. In the world of risk and fraud prevention, we tend to focus too much on how to uncover risk, and we forget that the business is about the good users. Knowing that a user is good is essential both for the business and for the risk operation. In our system, users that have achieved a “trusted” reputation have a 0.005% chance of fraud. The cost of reviewing trusted users simply isn’t worth it. In our beta clients, the system is able to predict the low risk users quite well. In one instance, a client was able to reduce manual reviews by 25-30% with less than 4% error margin. The graphs below represent a good user. The first one is the Identity Graph Intelligence, used as an internal representation of risk scoring. 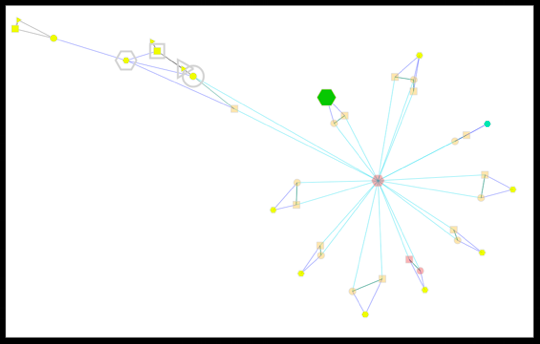 The second one is the eDNA graph (or entity graph), and it’s available in our user interface. 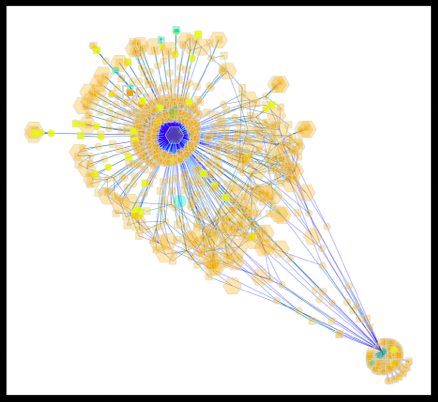 In the Identity Graph, a central core of entities have been used frequently together. Aspects of the transaction may look suspicious, but the risk score is 1.0, so the overall transaction is very low risk. As we mentioned before, spotting fraud rings in the graph is usually not too hard when you are looking at it. The eDNA graph below shows an actual fraud ring in one of our clients. Our client was able to spot it, because of the “bad” relationship to one of the initial transaction elements. Someone looking at just the transaction may have missed it, but the entity link shows it quite clearly. Now, let’s take a look at the Identity Graph Intelligence. The risk score was 0.50, almost as low as possible. In the graph it is quite obvious where the ring appears. The actual transaction is the one to the left connected through shipping addresses to the fraud ring. Once in a while you encounter fraud activity that traverses multiple clients. Sometimes it is so pervasive that all alarms go off at the same time across our network of clients. The example below has correlations across 36 of our clients. The graph speaks for itself. It has a risk score of 0.69, which some of us think isn’t low enough. IdentityMind’s platform is always evolving, we are constantly looking for better approaches to help our clients be more efficient in their day to day operations. Our latest release is a leap forward in realizing the benefits of the eDNA graphs. It makes it more accessible to all of our clients, but also to new companies looking to implement RegTech solutions. In addition, it also enables large organizations looking to implement entity link analysis as part of their overall fraud prevention and compliance technology strategies. We are committed to our clients and to innovation. We all succeed when we become more efficient protecting our businesses and the overall financial ecosystem.